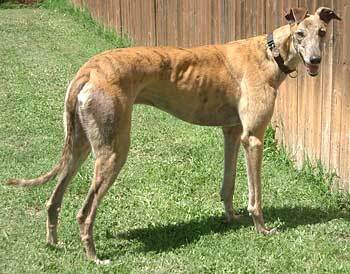 Kid, aka P's Sunset Kid, is an almost 3-year-old, light brindle male, born July 5, 2004. He came to GALT from Valley Race Park in Harlingen on Easter Sunday. His dam in P’s Barba Jo, making his grand sire P’s Raising Cain and his sire is Dodgem by Design, making his grand sire the late Gable Dodge. Kid raced in 52 races, starting at Valley Race Park in Harlingen December 5, 2005, then going to Corpus Christi and finishing up at Valley Race Park on February 23, 2007. He is settling into retirement quite nicely. Kid is a bit leery of new things and new people, but is learning to trust. Kid does not have much interest in cats, so he is cat tolerant. Kid, or Kidster as I affectionately call him sometimes, has made great strides in his confidence since being in a home. When we first got him and we approached him, talking sweetly, he would run to a dog bed and lie down and try to bury his head in a corner. He still has his moments like that sometimes, but they are few and far between. He will now come up to you for some attention and will even come when called most of the time. Kid is a very cute, sweet boy. He seems to have a nervous energy sometimes, which he lets out by pacing or running in the back yard. This does not happen a lot, but you can see that sometimes he is just not settled. He will greet you in the morning with his head lying on the side of the bed to get some lovin'. He eats very well but is not very food motivated. He likes a quiet place to eat and does not bother the other dogs' bowls while they are eating. He has learned quickly which food bowl is his and runs to it when we put the food down for him. Kid is playful and loves to carry and throw toys around and try to catch them. He sometimes empties the toy basket and carries all the toys to another room. He is learning that he can play with the toys with people too. He sometimes 'talks' when he is playing or needs to go potty, especially in the morning. He has not had any accidents in the house after the first couple of days of learning the ropes of being in a home. He will let you know he needs to go out by going to the back door and touching the doorknob with his nose, or if you are not paying attention he will whine. He listens well and responds to "No!" if he ever is doing anything you would prefer he did not do. But you don't really need to do this very often with him as he is a good boy. He walks well on a leash and likes to go for walks. He jumps into the car to go for a ride and lays down and is a good rider. Kid has very good house manners. He sleeps quietly, all night on a dog bed in my room. When we leave the house, we no longer crate him. Kid dislikes being crated and gets stressed out while in a crate. We just put a belly band on him, which has never been wet when we get home and hand him a treat as we are leaving. He does well not being crated. Kid gets along with the other dogs and cats that are in the house. With Kid's personality, he gains a lot of confidence from the other dogs around him, so I am not sure he would do well as an only dog. 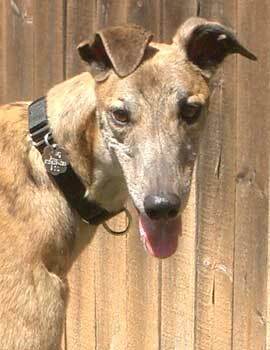 If you are looking for a sweet, well-behaved boy, Kid might be just the Greyhound for you.